The Canadian Geoscience Education Network (CGEN) is the education arm of the Canadian Federation of Earth Sciences. CGEN is a national network of more than 500 people, located all over Canada, involved in earth science education and outreach. The membership is pretty well split between K-12 teachers and professionals working in all sectors of the earth sciences. CGEN acts as a forum for discussion of matters related to geoscience education in Canada. Since programs related to education in schools are best delivered on a local scale, CGEN is a collective of grassroots activists who deliver programs in their local areas. CGEN undertakes initiatives that can only be conducted on the national scale and raises funds to support grassroots activities. 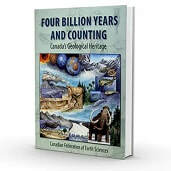 This website is the archive branch of our parent website (earthsciencescanada.com/cgen/). In addition to our CGEN Newsletters you will be able to find documents and articles deemed to be of significant importance to our members. These documents will be located under the various tabs above. Most documents are provided in PDF format and require a PDF viewer. The search function provided on this website works with web-based text. It DOES NOT search documents or document titles. We will do our best to provide appropriate descriptions for the documents posted on this website and welcome any suggestions that might improve your searches.